DSTB Notification is out. DSTB is recruiting for 40 Junior Research Fellow And Senior Research Fellow Govt Job Posts. You can check DSTB - Dept. of Higher Education, Science And Technology And Biotechnology last date, download DSTB notification, visit DSTB official website and check other DSTB Vacancy details.Complete Vacancy and recruitment Details about 40 Junior Research Fellow And Senior Research Fellow Govt Job vacancies in DSTB are provided below by JobSarkari.Com only for you. Date of Interview For Junior Research Fellow. 06/12/2018. Date of Interview For Senior Research Fellow. 07/12/2018. Junior Research Fellow. 15. 06. 07. 02. 30. Senior Research Fellow. 05. 02. 02. 01. 10. Total Vacancy. 20. 08. 09 03. 40. Junior Research Fellow. Candidate Must Have Passed Masters Degree in Geology/ Applied Geology/ Geography/ Environmental Science/ Remote Sensing And GIS/ Water Resources/ Civil Engineering With 55% Marks (50% For SC/ST/OBC). Senior Research Fellow. Candidate Must Have Passed Masters Degree in Geology/ Applied Geology/ Geography/ Environmental Science/ Remote Sensing And GIS/ Water Resources/ Civil Engineering With 55% Marks (50% For SC/ST/OBC) And Having 2 Years Experience in Related Field. Junior Research Fellow. Max 30 Years. Max 35 Years. Senior Research Fellow. Max 35 Years. Max 40 Years. 3. Candidate Need to Fill All the Details in Application Form And Need to Attach All Mandatory Documents. 4. Candidate Need to Go on Given Address on 06th December 2018 And 07th December 2018. Conference Hall, Dept. of Science & Technology, Bikash Bhavan (4th Floor), Salt Lake, Kolkata – 700091. Q. 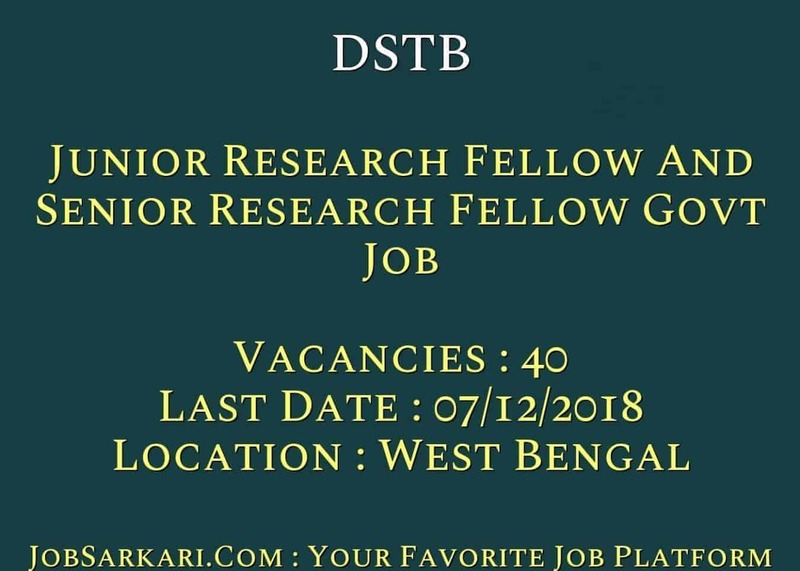 What is the Last Date For DSTB Junior Research Fellow And Senior Research Fellow Govt Job Vacancy ? A. 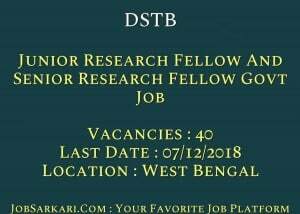 Last Date for DSTB Junior Research Fellow And Senior Research Fellow Govt Job Posts is 07/12/2018. Q. What is the Form Type of DSTB Junior Research Fellow And Senior Research Fellow Govt Job Recruitment ? A. The Form Type for DSTB Junior Research Fellow And Senior Research Fellow Govt Job Posts is Offline. Q. How many vacancies are available in Dept. of Higher Education, Science And Technology And Biotechnology Junior Research Fellow And Senior Research Fellow Govt Job Posts ? A. There are about 40 Vacancies in Dept. of Higher Education, Science And Technology And Biotechnology Junior Research Fellow And Senior Research Fellow Govt Job Posts. Q. What is the Full Form of DSTB ? A. Full Form of DSTB is Dept. of Higher Education, Science And Technology And Biotechnology .